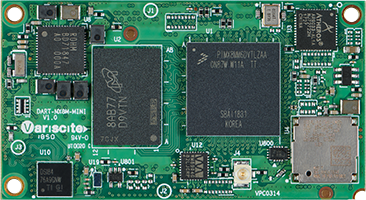 Supporting the i.MX 8M Mini, the DART-MX8M-MINI is a pin2pin scalable option to the DART-MX8M, with lower power consumption and higher CPU performance, providing our customers with ultimate flexibility. The DART-MX8M-MINI offers an integrated 1080p video encode and decode acceleration support, 2D and 3D graphics, HQ audio and a wide range of connectivity options such as certified Wi-Fi/BT, Ethernet and USB. This page was last modified on 17 April 2019, at 18:53.